It’s been a little over a year since Avalon International Breads started encouraging its customers to compost most of their waste, rather than throw it away. 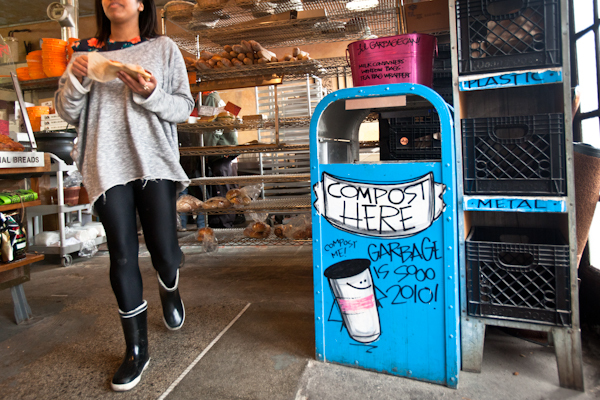 "Garbage is sooo 2010," reads the big, bold sign painted on what used to be the garbage can and what has been transformed into a jaunty compost bin. Simple but detailed instructions also adorn the large, colorful receptacle: "Compost Here: Food, Cups, Lids, Utensils, Salad & Dressing Containers, Paper, Soup Cups & Lids, Paper Bags, Deli Wraps." And then, in characteristic Avalon fashion, a big "Thank You!" and a heart. Next to the compost bin are the recycling bins, housed in a metal and wood frame that’s been there since the bakery opened in 1997. And garbage? Well, if you really need to throw something away, there’s the "itty bitty garbage can," which sits on top of the much bigger compost bin in an arrangement that makes clear to anyone who walks in the door what Avalon’s eco-conscious values are. The remarkable truth is that there’s hardly anything you can buy at Avalon these days that you can’t consume, compost, or recycle. According to the sign on the itty bitty garbage can, it is reserved for plastic bags, milk cartons, and the window bags that some loaves of bread come in. Co-owner Ann Perrault told me that plastic bottle tops are one other item that could be added to that list. The folks at Avalon really don’t want you to throw their products away. They know, as environmentalists have been saying for decades, that there really is no "away," and they’re more committed than ever to minimizing their contributions to local landfills (or the incinerator).